The Wine Studies Research Network at the University of Newcastle is home to Australia's foremost researchers and thought leaders in the areas of wine history, sociology, tourism and business. Our wine research academics provide critical new insights into Australia's global wine trade, its history, its impact on tourism and the migration of Australian drinkers from beer to wine. 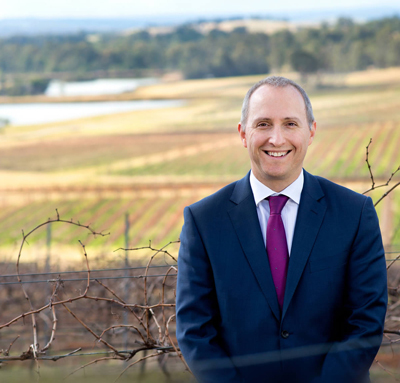 Currently a number of members are involved in the Australian Research Council (ARC) Linkage Project – Vines, Wine and Identity: The Hunter Valley NSW and Changing Australian Taste. 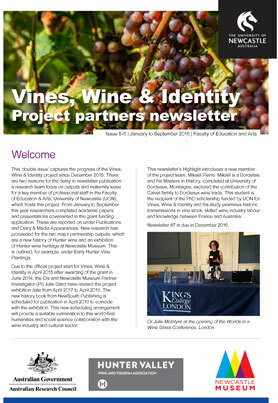 If you're looking for media commentary, expert testimony, panel participation or interviews, or background information on wine research at the University of Newcastle, please contact us. 'Light' Wine: Good for Your Waistline or Just Producers' Bottom Line? Australian wine is famous the world over but just over 200 years ago there were no grape vines here. Learn more about Australia's wine history in this 11 part radio series by Dr Julie McIntyre. Episode 1: Join researcher and historian Dr Julie McIntyre as she travels to Sydney's CBD to find out where the first grape vines were planted in New South Wales. Episode 2: Heritage gardener Colin Mills points out the old site of the Macarthur vineyards and you'll hear about the Germans who came there to help make wine. Episode 3: This week on Vintage Stories, Dr McIntyre meets a descendant of the German vinedressers who helped William Macarthur make wine. Episode 4: Dr McIntyre travels to Mudgee to meet Drew Stein, descendant of the historic German vinedressers from Camden Park, at the foot of the Mudgee hills. Episode 5: This week's Vintage Story is close to the heart of our wine historian, Julie McIntyre. To tell it she paid a visit to Laura Kurtz, keeper of the family stories. Episode 6: In this week's Vintage Stories, Dr McIntyre visits 94-year-old Perc McGuigan at his home, where he's been working on his memoirs. Episode 7: This week on Vintage Stories you'll meet one of Australia's most historic wine families – the Tyrells. Episode 8: In this episode Dr McIntyre meets Max Drayton, the great-grandson of Joseph Drayton, a man deeply connected to his family's wine growing heritage. Episode 9: Next time you pour yourself a glass of wine, spare a thought for the men and women who work in the vineyard to grow the grapes to make that lovely drop. Episode 10: On Vintage Stories, Dr McIntyre talks with third generation Hunter Valley wine grower, Jay Tulloch. Episode 11: In the final instalment of Vintage Stories, we look at what experts says is the biggest challenge facing the wine industry now – climate change.